Published on February 17, 2012 at 2:08 pm . Win a Hyundai Veloster or $21,000 cash. VANCOUVER, BC, February 17, 2012 — The deadline for the first Early Rewards draw for BC Children’s Hospital Choices Lottery is MIDNIGHT TONIGHT! Published on February 15, 2012 at 10:33 am . The Stanton Territorial Hospital Foundation is holding a $40,000 cash raffle! Published on February 11, 2012 at 10:48 pm . Win a trip to Costa Rica or take $30,000 cash! ONTARIO, February 11, 2012 — The Princess Margaret Home Lottery‘s first VIP Bonus prize for their 2012 lottery is a trip to Costa Rica, or take $30,000 cash, according to the limited information on their website. Published on February 10, 2012 at 8:21 am . ALBERTA, February 10, 2012 — The 2012 Full House Lottery is here, here’s the information according to their website. Published on February 10, 2012 at 5:31 am . ONTARIO, February 10, 2012 — The Daffodil Daily Lottery VIP Bonus Prize deadline is midnight. Published on February 9, 2012 at 10:12 pm . ALBERTA, February 9, 2012 — According to their website, the 2012 Foothills Hospital Home Lottery just launched. Published on February 9, 2012 at 7:04 pm . There are TWO early Bird draws for $50,000 each! Published on February 9, 2012 at 6:37 pm . Tickets selling fast in the 2011/2012 lottery. ONTARIO, February 9, 2012 — According to their website, there are less than 1,000 tickets left for the Bluewater Health Dream Home Lottery. Published on February 9, 2012 at 4:15 pm . Deadline Midnight February 17, 2012. Draw March 9, 2012. Winner will choose one prize option; other prize option will not be awarded. Published on February 6, 2012 at 10:12 pm . 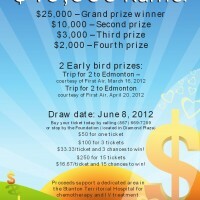 Win a 2012 Lincoln MKT in the Canadian Cancer Society’s Daffodil Daily Lottery. Deadline midnight February 10.